The title of Waterloo’s Literal Spling was quite a hefty hint wasn’t it? I was going to write HFTY hint but decided that I would be incapable of pursuing that line for very long so entertained myself, instead, by reading through Waterloo’s clues to confirm that he retains his place with the Listener imbibers and, of course, he didn’t disappoint, opting, almost from the start for high-class sherry. ‘The Spanish sherry, unfinished, with delicate charm (4)’ gave us EL FIN(o) which we decided to enter as LFIN. We had already decided that there was an ELL missing from the heart of ‘Literal Spling’ (though first thoughts led us to wonder whether all the Ls were to change to Rs and Rs to Ls giving Literal Spring, for example). 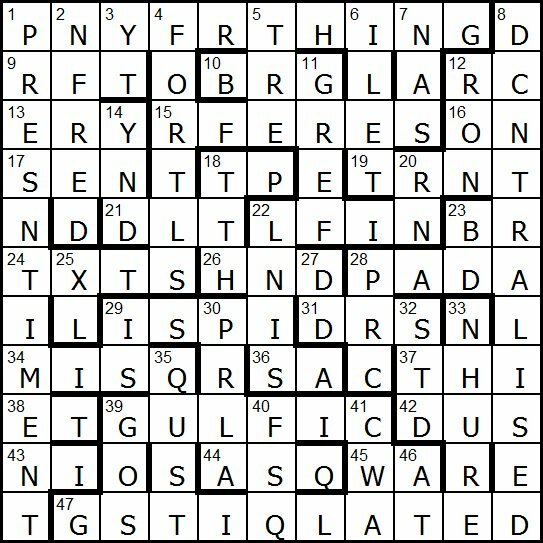 We also counted clue lengths, of course, and established that in this non-symmetrical grid with its astonishing two-letter solutions, the solutions were, all but one (‘Game using initials sound like two letters on the menu (4)’ = ICE PIE “heard” = I SPY, which we entered as ISPI) shorter than the given word-lengths. What we had to do was fairly obvious, though we bickered about some of the entries. For example, an obvious anagram ‘Signed, rearranging details, eg cut (12)’ gave GESTICULATED. We had to enter that as G + S(ess) TI + Q(ue) LATED. However, we were entering the second I of I SPY phonetically as I, so why not enter the first G of GESTICULATED phonetically too as J? That’s how it appears in Chambers – ah, but then we look up G in Chambers and find that it is pronounced ‘je’. Why too, we wondered, were we entering a couple of Es in PRES + N (en) TIMENT? Wouldn’t PRSNTIMNT suffice? (especially as the ‘enn’ in DECENTRALISE was entered as N – DCNTRALISE). It was all mildly disconcerting! Waterloo’s clues were generous and caused us little anguish. They even gave us a few smiles. SA (essay) being the solution to ‘Lamb product, perhaps? Yes a singular stew (5)’, when we were expecting a chop or a leg of lamb. and ‘River – wild rush, but no gold (5)’ giving T[OR]RENT, which we entered as TRNT. I was surprised to see ‘Former partner and listless musician are exceptionally good (5)’ giving EXCEL (entered as XL) where ‘listless’ referred to losing the LIST from CELLIST. We don’t often see that device in a Listener crossword. But then, I don’t think I have ever seen anything quite like this, so must just hope we got it right and congratulate Waterloo on his originality. Waterloo’s pseudonym should be Mister Quirky since the themes for his puzzles are somewhat off-the-wall. Do you remember last year’s Alcoholic Baseball Player with its Mrs Malaprop style clues, or OO! Spectacles? from 2015? The titles of his puzzles are enough to cause a chuckle. There’s not an awful lot to say this week. 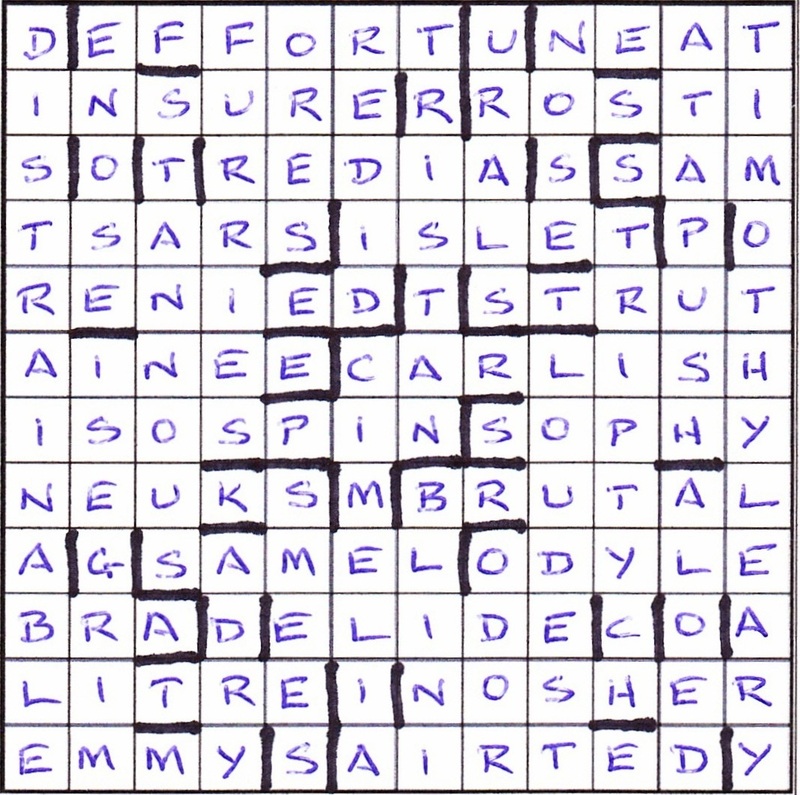 It was a fairly small 11×11 grid but with 55 clues, many leading to entries of just two or three letters. Moreover, the preamble told us everything we needed to know, namely that every entry was to be treated thematically in the same way as the title. Thus letter sounds were replaced by the letter itself. My first pass through the clues got me just over half slotted in, only 1dn PRESENTIMENT causing an ambiguity with just one EN needing to be reduced to N. However, with 47ac GSTIQLATED and 8dn DCNTRALISED the grid was filling nicely, although I was a bit slow on the uptake with 1ac PNYFRTHING. The last clue I got was the enjoyable 33dn Born with innocent uninitiated character (6) for NHURE. Other entries that I liked were 28ac PADA (payday), 40dn FSQ (fescue) and 41dn CWA (seaway). All that was left was to correct 22ac The Spanish sherry, unfinished with delicate charm (5) which I had carelessly entered as LFEN instead of LFIN! My last task each week is to carry out a full check of every clue to ensure that both definition and wordplay make sense. I started this after misspelling RANGATIRA in Samuel’s puzzle last year. A close call this week. Thanks to Waterloo for another entertaining and slightly wacky puzzle. The puzzle was the merging of two ideas. About four years ago something reminded me of Timothy Leary’s famous (notorious?) quote, and I thought it was ideal for crossword treatment. I couldn’t recall any Listener on the same theme, though it turns out there was, some years before I started solving the Listener. To begin with I drew up a list of words in which insertion of a synonym for TUNE, reversal of ON and removal of OUT still left real words. For the insertions, the options were limited – AIR was easy, but there were few possibilities for TUNE (ford, miss, red, unable), STRAIN (coning, diable), TEMPER (dissed, welled, evened). At the same time I was thinking of a puzzle in which an asymmetric grid is re-barred symmetrically to reveal new words. The two ideas came together and I saw this puzzle as a possible vehicle for that idea since I wouldn’t be restricted to modifications that always resulted in proper words. Initially I wasn’t sure how to introduce the thematic hint. It could have been another part of the quotation given through a clue gimmick. However, I veered away from a clue gimmick since it would make cold-solving clues even harder. I decided on a thematic revelation in the grid, namely TIMOTHY LEARY, which determined the 12×12 grid. Some early grids had TIMOTHY LEARY on a main diagonal, but solvers would not see him until the grid was complete, so he had to be an entry. I did need one word that thematically treated became a proper 12-letter word as a symmetrical partner to TIMOTHY LEARY. There were only five suitable candidates: COASTERS/COTONEASTER (which uses a rather obscure meaning of TONE), DOCTRINES/DOCTRINAIRES, CONING/CONSTRAINING, OUTING/OUTSTRAINING, DIABLE/DISTRAINABLE. TONE wasn’t really suitable as a synonym for TUNE since it contains the letter pair ‘ON’. That would get solvers really confused since they might wonder if it should be entered as TNOE. That thought only occurred to me after I’d constructed a few early grids in which TIGHTWAD or TOUCHPAD in row 1 became TIGHT/W/ATONED or TOUCH/P/ATONED. In the end I used DISTRAINABLE for the symmetrical partner to TL since it was the easiest to accommodate. The main difficulty in the grid construction was that Sympathy’s autofill kept using words containing ON in addition to the ones I planned to use. Fortunately unwanted words can be added to a ‘kill list’, which grew to about 40 unwanted words containing ON. The other problem was achieving an acceptable average word length. I found it difficult to avoid a number of short words, especially for the ON reversal, so the average word length of the initial grid is below the recommended 5.5 minimum. I wanted the average word length of the final grid to be higher than that of the initial grid. I also aimed for a high percentage of checked cells to make things easier for the solver. Early grids had around 78% of cells checked by crossing answers. Gradually I managed to push that up to the final figure of 88% (compared to around 75% in a standard Ximenean grid) with 23 answers or entries fully checked. I now had an asymmetrical carte blanche grid with twelve modified entries, most of them non-words. That was going to be a pretty tough challenge. How could I ease things for the poor solver? I made the first few across clues and four of the first five down clues reasonably easy in the hope that this would give solvers a toe-hold on the upper part of the grid, then scattered some easy clues throughout the rest of the puzzle, trying to ensure that definitions and wordplay were unquestionably fair. The final decision was whether to clue TIMOTHY LEARY or not. I decided to try it out first on some test-solvers without any clue, merely the information that the modifications followed the advice of an unclued entry. I was confident that there was only one way the grid could be re-barred using 56 bars, so testers were not told the number of resulting lights. The first tester solved it correctly the same day I sent it; the second found it very tough but succeeded in the end, so I knew it was solvable with an unclued ‘source’. Both were very positive in their responses. One tester made a slight barring error, so I amended the preamble so that future solvers would know the final grid contains 44 words and phrases, all Chambers entries or proper nouns. I then sent it to Magpie, only to learn from the first vetter that a puzzle on the same theme (with the same title – A Political Statement) had appeared in a 2010 Magpie issue. He had also done some research on Dave Hennings’s excellent Crossword Database and told me that it had also been the subject of a Listener in 1999 and two Inquisitors (2007 and 2011). Inquisitor and Listener solvers don’t necessarily coincide, so I wasn’t particularly concerned about the Inquisitor puzzles, and 1999 seemed sufficiently distant, so I decided to send the puzzle to the Listener editors. Before sending it I did some further research and discovered that the original series of lectures, The Politics and Ethics of Ecstasy, was delivered at various venues from June 3-10, 1966, so publication in late May or early June 2016 would represent a 50th anniversary. Timothy Leary died on May 31st, 1996, so it would also be a 20th anniversary. As the title, “A Political Statement’ had been used before, a change was necessary. I came up with various alternatives, but I’m indebted to one of the test-solvers, Wan, who suggested ‘Three Steps to Heaven’. At least two lucky solvers found that helpful since it enabled them to guess the theme immediately. INITIAL VERSION: no clue/s to TIMOTHY LEARY – the preamble stated that twelve answers should be modified according to the advice of an unclued entry. Testers were told to insert 56 bars but were not told the number of lights in the final grid. FINAL VERSION: solvers were told that there were four examples of each type of modification, and that the final grid contained 44 lights. At the suggestion of one of the editors TIMOTHY LEARY was clued as two separate words, an option I’d previously considered, so I was happy to accept it. Once it was published I nervously checked Answerbank around four p.m. on Saturday to see what sort of reception the puzzle was getting. There was no thread. I realized then just how hard the puzzle was, probably as tough as a Sabre. The first post appeared shortly thereafter. This is probably the toughest Listener I have ever set, though that’s not what I set out to achieve. I realize that carte blanche puzzles are not to everyone’s taste, and carte blanche puzzle with some odd entries will have even less appeal to many. I hoped that the transformation resulting from the re-barring would give some satisfaction after a tough solve. Judging from feedback via John Green and responses on Answerbank, the vast majority of solvers seemed to enjoy the challenge. My thanks to all solvers for their perseverance, and my commiserations to all who either failed to finish or felt it was a less-than-enjoyable slog. I have had that feeling myself on some occasions. My biggest regret is that some solvers, having struggled through to the end, made errors in the barring. It was not my intention to trip solvers up at the last minute. Given the information in the preamble I didn’t think it was possible to bar it differently. After first designing the grid I tried many times to see if an alternative barring were possible and I failed every time. None of the test-solvers and Listener vetters reported a valid alternative, so I was satisfied that there was no ambiguity using the standard references. Some solvers on online forums suggested UNEAT for the right-hand entry in row 1, but I cannot find UNEAT in Chambers Dictionary or the Oxford Dictionary of English, so that doesn’t seem a legitimate choice to me. I took care to ensure that all words and phrases apart from proper nouns were in Chambers, and it is standard Listener practice to flag any non-standard words in the preamble. There was no Dysart last year, so I wondered whether he might have something dastardly in store for us here. I don’t think I’m giving too much away by saying that that was an understatement! For a start, it was a carte blanche, but that shouldn’t be too daunting — we’re used to those. The preamble began innocuously: “Clues are given in conventional order.” After that, it got decidedly nocuous. Twelve answers would need modifying before entry, not necessarily making words… in three ways, four of each type… there would be some advice… but I’m not telling you its source… it will become evident… but I’m not telling you how! At the end, we would be required to rejig the grid so that it would display 180° symmetry… because it wouldn’t be symmetrical after the initial fill! This was definitely time to have a cup of tea and a bit of cake. A lot of cold solving lay ahead, starting with a clue I managed to get wrong, although I think I realised straightaway that 1ac Brilliant investigator in Florida backtracks (3) probably wasn’t the simple hidden DAB. A dab was an expert but not necessarily brilliant. Anyway, FORA, INSURER and ROSTI came next and I thought about pencilling them in the grid. However, I wasn’t sure exactly where, or more appropriately how, so I decided to scan through all the clues to see where that got me. There were 50 clues altogether, and in under half an hour I had solved 14 out of the first 25. This would be easy, thought I. 20 minutes later and I had solved another 11, making 36 out of 50. What’s more, clue number 27, about half way down the list, was DIABLE and that could be the first down entry coinciding with DAB (which I still knew was wrong). However, 28 was EONS and that enabled me finally to get DEF at 1. It looked as though INSURER would need to go in the top row or undergo some jiggery-pokery to fit at the beginning of the second row, followed by ROSTI. Of course, the second option would leave a large gap in the top row to the right of FORA. I was now trying to work out what sort of modifications (three types, each affecting four answers) we might be dealing with. Jumbles, missing letters, extra letters, replaced letters? Nothing seemed obvious. I solved a few more clues, and after about four hours, I had all but ten. EONS would have to become ENOS or ENSO (or perhaps even ENVIRONS or ENCRUSTATIONS) to fit with INSURER, but that still left a huge gap in the top right. My guess was that TIMOTHY (which I solved quite late… and well after the preamble’s reference to a source becoming evident had faded from my mind) would go down the end column, and with URALS and ATAP to its right, perhaps UBOAT would occupy the top row somehow! A few clues still lay unsolved. These included 10 With case rebuffed, Peter perhaps gave up forsaken (6) and I wondered which Peter Dysart was referring to. 15 A number of particle physicists accordingly implicated in PR man’s admission (7) was also giving me problems. I had guessed that “a number of particle physicists” would refer to some sort of number, like π, but hey!, I don’t work at CERN. At the end of the afternoon’s solving, I had managed to fit BRUTAL, DECO and STED somewhere in the bottom right meshing with LOUDEST, TYCHE and HALOED. I decided that a break would be in order (I’d actually had two or three already) and leave the puzzle till the following day. At this point, I was also missing 48 Move up close to rival in low cunning (5). Despite ‘knowing’ that close to rival would be L, and that low and cunning would probably need to be treated separately, it was only as I was laying in bed that night that I realised what the clue was telling me. A quick reference to Mrs B the following day identified ‘early’ under low, and LEARY got slotted in the bottom right. I was so relieved, that it took me another ten minutes to realise that I had TIMOTHY LEARY down the end column, and all became clear. I remember from an earlier puzzle (I’m guessing Loda’s IQ 1196, Seriously… back in 2011, although it didn’t seem that long ago) that Leary’s famous phrase (and book) was “Turn on, tune in and drop out”. I was home and dry. Four words had ON reversed (IONS, EONS, ONSET and ONUS), four had words for ‘tune’ inserted (TUNE, MELODY, AIR and STRAIN), and four had OUT dropped (OUTLET, LOUTISH, OUTHER and OUTDID). A short while later and I had a filled grid, including 10 and 15, RENIED and ISOSPIN respectively. Kudos to those who sussed the theme as soon as they solved TIMOTHY and/or LEARY, and also to those who got it from spotting the prevalence of ONs and OUTs in their answers. This was a classic Dysart, and I couldn’t fault the clues. Having said that, I probably couldn’t have cold-solved 10 (Peter the Denier becoming RENIED) without going through Chambers word by word… several times. Eventually, my grid was redrawn, and I made sure that I had the requisite number of bars (56) and entries (44). We’ve certainly had a few tough Listeners recently, so thanks to Dysart for another one that exercised my grey cells. Perhaps if I’d been on drugs I’d have got there sooner! Some themes are irresistible. Who could read the ODQ and come across the Timothy Leary quotation ‘Turn on, tune in, drop out’ and not think ‘Ah, that’s a superb theme for a crossword’? Well, I certainly couldn’t and seven years ago set my version and sent it off to my kind test-solvers, only to open my mail and find one on exactly the same theme from one of them. Nudd’s appeared in the Magpie in 2010 (issue 92, No 2 Political Statement) and mine sat on the side burner until it appeared in May 2015 as ‘Seriously’ (http://www.crossword.org.uk/seriously.html). How Dysart must have cursed us, as his was probably already in the Listener queue. Easyjet had just cancelled our Thursday flight as a result of the French strike, and sent us racing across Belgium, Germany and Switzerland in an almost non-stop 24-hour drive so I was not looking forward to Friday evening’s solve but the theme leapt out at me ‘Twelve answers must be modified before entry … in one of three ways (four of each type), according to advice from a source that will become evident’. ‘Three Steps to Heaven’ claimed the title, so I scribbled ‘Turn on, tune in, drop out’ on my clue sheet before scanning the clues to confirm Dysart’s membership of the Listener Setters’ Oenophile Outfit. LSD happily turned up as I scanned, and a likely TIMOTHY clue and a LEARY ‘Grass tree damaged by grubs (7)’ = TI + MOTHY and ‘Move up close to rival in low cunning (5)’ moved the L of rivaL up in EARLY giving LEARY. Floods of alcohol and a fair amount of food turned up too. We had a ‘Son tucked into kind of sandwich and fried potatoes (5)’ S in ROTI = ROSTI, ‘Italian composer disposing of the Spanish pancakes (5)’ B[EL]LINI, ‘Shops old piece of meat about to be binned (6)’ O + [C]UTLET = OUTLET and ‘Casserole made from pieces of duck breast I stewed with ale (6)’ giving D B I ALE* = DIABLE. As well as that ale for cooking, Dysart had ‘French painter half drunk (3)’ [TIS]SOT and that drunkenness was no surprise as we then found ‘Hard American drinking a dash of rusty nail = BAD round R = BRAD, then ‘Drunk on this amount (5)’ LIT + RE and finally ‘Poet’s in need of a drink, perversely giving up whiskey for daughter (4)’ AWRY with D for W. Well, cheers, Dysart! We knew what we were going to do in the grid and when I hopefully put TIMOTHY LEARY down the right hand side, intersecting with the I or ROSTI, and completed that row with INSURER, it seemed obvious where one of the four TUNEs had to go. We tentatively put DEF FOR[TUNE]AT as our top row and put an AIR into our bottom row with EMMY S[AIR]TED and the Y of LEARY. This placed 17 of the down clues and convinced us that those began with DIABLE. STRAIN obligingly completed our first column with DI[STRAIN]ABLE and, as we fitted the solutions to these relatively generous clues into our grid, ?ELODY appeared – obviously MELODY. We knew we had to drop OUT four times. and soon located [OUT]LET, L[OUT]ISH, [OUT]HER, and [OUT]DID and as the grid was populated, had only to confirm that we had turned ON four times: we found IONS, EONS, ONSET and ONUS – and all was well, except that I had been using bars to construct my grid and now had to remove them all and somehow split this set of 144 letters into 44 words with symmetry and only 56 bars. I had admired Dysart’s cluing and use of the device, but this was certainly the master stroke. With 180° symmetry set on the ‘crossword compiler’ programme, it was a relatively easy and enjoyable task that took only a few minutes but I wonder how difficult it was for anyone working on the newspaper grid. It was certainly a brilliant piece of setting. Many thanks to Dysart.